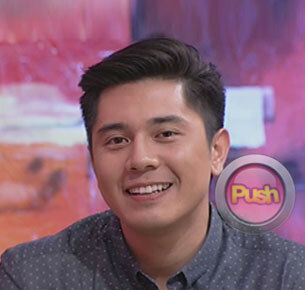 Coming right on the heels of the admission about his break up with now ex-girlfriend LJ Reyes, the ever-shy Paulo Avelino, much to the viewer’s surprise, revealed that he is actually seeing someone new at the moment and that someone is none other than KC Concepcion. However, he said that he’s “happy” at the moment. According to Paulo, he has known the daughter of Megastar Sharon Cuneta for a couple of years now. In fact, he even recalled that his first project since transferring to the Kapamilya network two years ago, which is a Maalaala Mo Kaya episode was actually with her. Three weeks ago, the former Huwag Ka Lang Mawawala star hogged headlines and shocked the Netizens after posting a collage of photos seemingly having a good time with NBA player Chandler Parsons on her Instagram account. "Mabuhay! So much to see, so little time! Fun night with my ladiez & the big boys. @chandlerparsons," the photo’s caption read. Recall that the NBA teams Houston Rockets and Indiana Pacers came into the country weeks ago for a pre-season game held in Pasay City last October 10 which was also attended by KC. Days later, KC, who was also very quiet about her personal life off late, dismissed any romance with the basketball star saying that “"Friends kami, yun lang yon!" According to Paulo, he didn’t even get jealous about KC’s friendly date with the American cager. But how did he learn about that night out? Has KC personally informed him about the said date? “It was all over social media,” said he. Recall that Paulo was in a relationship for almost four years with LJ, with whom she had a son named Ethan Akio. While KC’s last relationship was with actor Piolo Pascual but he was last wooed by French director Pierre-Emmanuel Plassart.